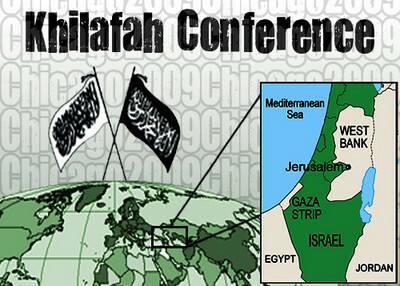 While Hizb ut-Tahrir, a pro-jihadist group which met openly near Chicago last weekend, is surprisingly candid about its desire to re-establish an Islamic Caliphate, literature available at its conference shows the group also views Christians and Jews as untrustworthy enemies of God. More than a dozen issues of a Hizb ut-Tahrir (HT) newsletter called The Shield were obtained from the conference by the Investigative Project on Terrorism. The publication repeatedly condemns interfaith "outreach initiatives" and shows HT believes in the death penalty for Muslims who leave the faith. HT pushes a radical ideology that is similar to Al Qaeda, although the organization claims it does not carry out terrorist attacks. It has glorified jihadism and excoriated the terrorist organization Hamas as being too soft on Israel. In a leaflet posted on its website July 1, HT argued that if the Caliphate were in existence, all of "Palestine" would be rid of "the usurpation of the Jewish occupiers" and brought "to the fold of the Islamic state." Turkish authorities meanwhile, arrested more than 200 HT members Friday, although it is unclear what prompted it. The group is banned in Turkey. Last week, U.S-based HT members gathered at the Hilton Hotel in Oak Lawn, Ill. for a conference called "The Fall of Capitalism and the Rise of Islam." In addition to speakers' calls to fight "to establish Allah's (swt) word supreme on this earth ... or we die in the attempt," HT literature was available for the audience. "Interfaith Deceit" blared a front-page headline about such programs in the April 2009 issue of The Shield. "Just what is the meaning of 'interfaith'?" the newsletter asked in a front-page commentary. "It means to exchange, to come to a mutual agreement with one another, to reciprocate, share, join, belong equally with each other in common, to trust, accept, etc. In other words, it is an attempt to get Muslims to compromise their Deen (Way of Life)." "Are Muslims telling the disbelievers that riba -- mortgages, car loans, credit cards, bank savings, accounts, stocks, etc. -- are forbidden by God? Do Muslims say to non-Muslims that alcohol, homosexuality, fornication, gambling, church bingo, raffles, etc. are wrong? Have they told them that their system of rule is against Allah's rule, and that Islam alone will solve all of the problems, political, economical [sic] educational and societal? Or are they (Muslims) suggesting to non-Muslims that Islam and democracy can co-exist and work together to correct the ills in the society?" Answer: If Muslims are trying to conduct a dialogue in which non-Muslims are treated as equals, this is unacceptable. Judaism and Christianity, it says, "started hundreds of years after Abraham and Jesus, and are great distortion of what they actually taught." In this context, Allah warns Muslims that if they were "to follow the common run of those on earth, they will lead you away from the Way of Allah. They follow nothing but conjecture. They do nothing but lie." If Muslims were to "listen to a faction among the People of the Book [Christians and Jews], they will render you apostates after you have believed." "Never will the Jews or Christians be satisfied with you unless you follow their Creed," the newsletter adds. "Sadly, we see Christians finding satisfaction in what their Muslim counterparts agreed to in their common exchange. It is not a believer's duty to please or try to satisfy the disbelievers." The July 2006 issue of "The Shield" obtained at the July 19 conference in Illinois was entitled "Interfaith Dialogue: Is it acceptable?" The answer is a resounding "no." Christians and Jews are "kuffar" (non-Muslims or infidels) and therefore: "To make it seem as if we are 'brothers in faith' with the kuffar is to commit a haraam (sin) and betray the Sunnah of Prophet Muhammad." Muslims "are not to sit and talk about common things between Islam and the corrupted teachings of Christianity and Judaism." The same publication contains an article titled "Muslims Who Love Allah's Enemies" consists of Quranic verses like this: "O Believers, do not take the Jews nor the Christians as your friends, they are one another's friends only. If anyone of you takes them as friends, surely he shall be counted among them. Indeed, Allah deprives the wrongdoers of His Guidance." "Have you not seen those who have taken as friends a people who are under Allah's wrath. They are neither of you or of them, and they swear to a falsehood knowingly. Allah has prepared a severe torment for them. Evil are the deeds they are doing. They have made their oaths a covering under which they debar others from the Way of Allah. For this they shall have a disgraceful torment. Neither shall their riches avail them anything to protect them from Allah nor their children. They are the fellows of Hell in which they shall live forever. The Day Allah raises them up, they shall swear to Him as they swear to you, thinking that their oaths will avail them something. Know it well that they are liars," the Quranic verse continues. "Satan has over-powered them and has caused them to forget God's remembrance. They are of Satan's party. Know it well that those of Satan's party are indeed the real losers. Surely the most abject of the creatures are those who resist Allah and His Messenger." Another publication was an Arabic-language paper from 1996 called "The American Campaign to Suppress Islam," a paper which outlines a purported conspiracy against Muslims by capitalists who control the United States. Page 20 of the booklet contains a dire warning for Muslims who think that freedom of religion applies to them. Muslims "have no option after embracing Islam to disbelieve in it and to renounce it. The rule regarding the Muslim who becomes apostate is to require his repentance. If he insists on his disbelief, the capital punishment is applied on him." "Thus it is evident that the Muslim is prohibited to accept the freedom of religion that Capitalists call for," the HT paper added. "Consequently, he is obliged to reject it and to challenge anyone who calls for it." The literature shows that Hizb ut-Tahrir envisions a very dark future for anyone -- Christian, Jew or Muslim -- who fails to adhere to its vision of Islamist dominance. Words are poision when they cause errors in thinking;that thinking then leading to actions;those actions then lead to consequences;those consequences care called the laws of the UNITED STATES;Adherents to any religion or movement that tries to take over our cgovernment shall be dealt with properly according to civilized procedures;Allah is my enemy if I am an American;allow me to prove it. Mayor Daley's 'Windy City' is a mecca for Muslim recruitment: Hizb ut Tahrir and CAIR-Chicago gather at a Chicago Hilton and the Oak Brook Drury Lane. The State of Illinois, and the City of Chicago in particular have been tarnished by the invitations to terrorist front organizations to set up shop and prosper. Like California, the 'Prarie State' is bankrupt and relishes any cash infusion to prop up the Illinois Department of Revenue. Enter Hizb ut Tahrir and CAIR-Chicago. I was taught some years ago that the Koran (quaran? ) specifically instructed that Muslims were to respect the adherents to Judaism and Christianity, and in the Muslim territories before they were driven out of Europe Charistians a;nd Jews were allowd to live and worship but had to pay a tax because they could not serve in the armed forces. Maybe my memory is faulty and I am unable to find my notes. If you read this comment and can furnish the appropriate surah of the Koran, I would apppreciate it. I'm certain that Hizb ut-Tahrir and his ilk can expect a very harsh future in mature democracies. We will cut them no slack. Failure to abide with the laws will net them loss of freedom. Their execrable belief system will fail.